There’s an old saying: “Even a blind pig finds an acorn every once in a while.” It came to mind when I chanced upon something unexpected while searching for duck at my local supermarket recently. I first heard about secreto when Steven blogged about eating (make that devouring) it at the Imperial restaurant in Portland, Oregon. Chef-owner Vitaly Paley grilled this “secret butcher’s cut” on a wine barrel stave over a wood fire. Incidentally, Chef Paley sources his secreto locally, true to the spirit of the TV show Portlandia. And instead of acorns, the Oregonian pigs feed on hazelnuts. The Ibérico pig (also called pata negra thanks to its distinctive black hooves) is one of the oldest heritage breeds in the world, likely a descendant of swine brought to the Iberian Peninsula by the Phoenicians in the 9th century BCE. By porcine standards, its life is idyllic. Once weaned, the young shoats are released into government-protected primeval oak forests and meadows to forage for acorns, wild herbs, mushrooms, and grasses. To preserve the delicate ecosystem of the dehesa, each animal is given the equivalent of 5 acres (!) to root and roam. Unfortunately, though highly prized in much of the world, the United States Department of Agriculture banned the importation of meat from Ibérico pigs years ago due to outbreaks of swine flu in Spain and Africa. The ban was lifted in December 2007. At that time, the Spanish company Embutidos Fermín was initially allowed to ship 300 cured hams to the U.S. It took five more years for raw Ibérico pork products—lardo, loins, shoulders, steaks, etc.—to debut in the American marketplace. But what exactly is secreto? Where does this cut, which usually tops out at a modest 1 1/4 pounds, come from on the animal? I took to the Internet to find out. There is surprisingly little information out there—the major food mags are apparently not onto secreto yet—and what information is there is contradictory. Tom Mylan, executive butcher and co-owner of Brooklyn’s Meat Hook, describes secreto as “a tender strip of pork hidden beneath a thick layer of belly fat.” Other descriptions I found included “on top of the brisket,” “behind the shoulder,” and “between the shoulder, ribs, and fatback.” To add to the confusion, the in-store weight/price sticker on the back of the package I bought called it presa de paleta—shoulder steak. I finally phoned the importer (Wagshal’s of Washington, D.C.) and spoke to a butcher who insisted secreto was pork skirt steak. My conclusion? There is no definitive answer. A butcher’s “secret cut” may depend on the butcher. 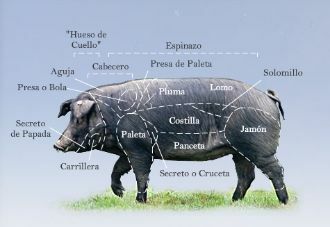 This Spanish anatomy chart confirms my suspicions by labeling three disparate parts of the pig secreto or presa de paleta (see the cheek, shoulder, and front loin). 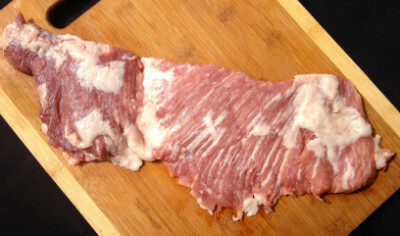 In any case, when released from its vacuum-sealed package, the secreto on my cutting board resembled a cross between skate wing and beef skirt steak. It varied in thickness from 3/8 to 3/4 inch, the thickest part being a coarsely grained triangle of meat in the center. Any visible fat was creamy and white. I cooked it simply on the grill over medium-high heat. Get the recipe here. The meat was supernaturally tender with a mild, nutty, porky flavor. Thanks to its generous intramuscular fat, secreto is juicy and rich; it is often compared to Wagyu beef. But because of the animals’ natural diet, the fat in Ibérico de Bellota is of the mono-unsaturated variety, the so-called “good” fat. 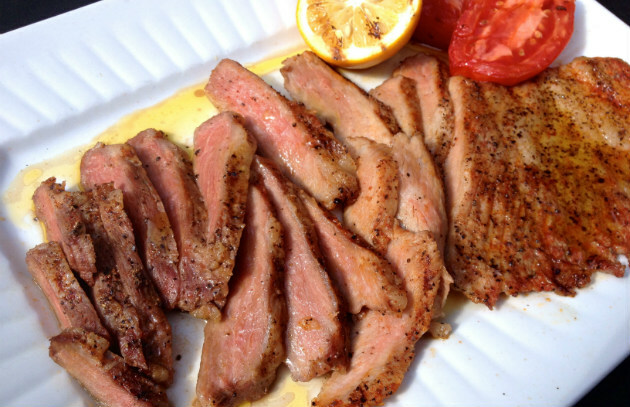 Like olive oil, the meat is also high in oleic acid. Next time—and there will be a next time—I would put a better sear on the outside of the secreto. At $26.99 per pound, I was afraid to overcook it. I would grill it over olive wood chunks as they do in Spain. And I would serve it with romesco sauce as Vitaly Paley does at Imperial. Though it may soon be coming to a supermarket near you, for now, you can order secreto online from La Tienda. Please post about your experience with this tantalizing new cut (include photos) on the Barbecue Board.